Chimney Pro-Fireplace Restoration.Chimney | Fireplace Repair in New York, NY. Chimney Pro is the number one professional chimney-fireplace company and custom fireplace design studio in New York City. Our main office is located on the Upper East Side in Manhattan where we have been proudly serving New Yorkers for two decades now. We have attracted a group of highly trained technicians and designers, unquestionably the most experienced team in town. Our quality work, professional approach, and knowledge are well known and respected all around the metropolitan area. We have been successfully working with architects, decorators, designers, engineers & homeowners through the most difficult chimney and fireplace (residential and commercial) projects in New York City, from brand new lofts of Tribeca and Soho to 150-year-old townhouses of Greenwich Village and the Upper East or West Side. Important Reminder: As of July 1, 2008, the New NYC Construction Codes are in effect. Our Code Specialists understand the New NYC Construction Codes and Standards for Chimneys and Fireplaces (areas frequently misunderstood), and offer professional consultations for architects, decorators, contractors and homeowners. Chimney Pro specializes in code consultations, chimney and fireplace design and sizing. We also specialize in regular or custom made firebrick fireplaces. Our custom designed and built masonry herringbone fireboxes set the quality standard which is unmatched by our competitors. Our technicians and associates can also handle all repairs needed to accommodate your fireplaces and chimneys: repair of fireboxes, chimney building, cleaning, relining and repairing, parging of smoke chamber, hearth repair, chimney cap and damper installation and repair, exhaust chimney fan installation, video-camera evaluations and inspections, safety condition reports, smoke and odor problem correction, chimney and fireplace professional sweeping and more. We can provide environmentally safe (dust free) working conditions in occupied homes, apartments and job sites. Chimney Pro's mission is to offer the highest quality work to satisfy all customers. 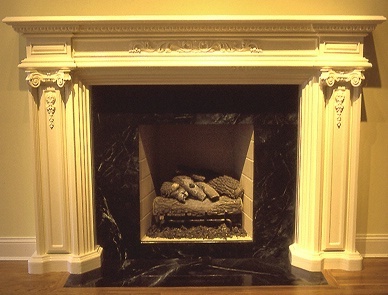 Chimneys and fireplaces designed by us always comply with the strict New York City Building Codes. We never sacrifice or jeopardize the safety of customers or the quality of our work. The success of the company comes from the knowledge, earned trust, experience and professional approach of our skilled and honest technicians to every project-no matter how small. Nearly 100% of the company's work is done in Manhattan, and more than 50% of contracts come from referrals from our satisfied customers. When quality and experience count, don't hesitate to call us for professional care of your chimney and fireplace.Our website provides all the information about the professional services we offer. We are worth the wait! Hot Topics: "New NYC Code Requirements for Chimney Liners" "Chimney and Fireplace Scams-Don't Get Scammed-Tips for Homeowners" "Vent-Free Gas Fireplaces and Gas Logs" and "The MEA Transformation". Warning: Be advised that copyrighted content of our website was stolen by scammers and posted without our authorization or permission on another website. We have already contacted the appropriate authorities and the Chimney Sweep Guild and informed them about this problem. We would like to warn all potential customers in our area to be extra cautious. Chimney repair and fireplace cleaning scams are on the rise. We always urge homeowners to be careful when choosing your future chimney company. Chimney Pro is not affiliated with any other companies, websites or associates. Furthermore, we have not authorized anyone to use our own copyrighted materials. All fireplaces in pictures posted on www.chimney-pro.com website were designed and constructed in New York City and should not be used on other websites (or elsewhere) without our written permission. This is a good example of how unregulated and unscrupulous industry can be. Update: The infringing website was shut down on January 18, 2008. WARNING: Chimney Pro holds the exclusive copyright © ownership of the layout and contents of this website. Infringements in any form and by any means shall be prosecuted. Please read important copyright information HERE. © 1996-2017 Chimney-Pro.com All Rights Reserved. Reproduction of any portion of this website without prior written permission is strictly prohibited.